I have been using Pixsy to protect my photos for more than 2 years now. I've written about the service before and have successfully closed infringement cases with Pixsy. I truly appreciate the service that Pixsy provides. No... Pixsy does not pay me to sing their praises (read my product review disclaimer). In fact, I pay them to help find people using my work without permission, and to handle all the legal matters to reach a settlement. Two weeks ago, the Pixsy site got a major update. Dare I say... an overhaul. The new design and interface is clean and slick, easy to work with, and well organized. 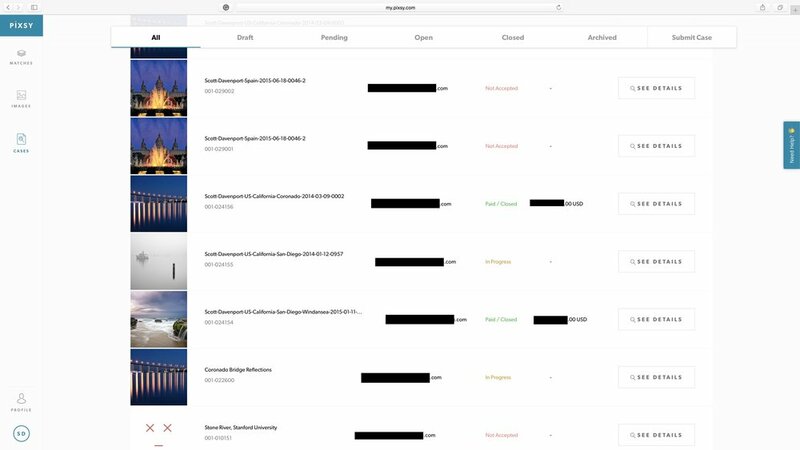 I thought I'd give a brief tour of how I use Pixsy to find infringements against my work. Before I do... why don't you try Pixsy. They offer a free plan. If you are sharing your work online (who isn't these days), let Pixsy scan the web for you, find matches, and help you be justly and fairly paid for your work. Got your Pixsy account set up? Good! Here's the basic Pixsy workflow that I use. Pixsy has a variety of ways to get your photos registered with the service. 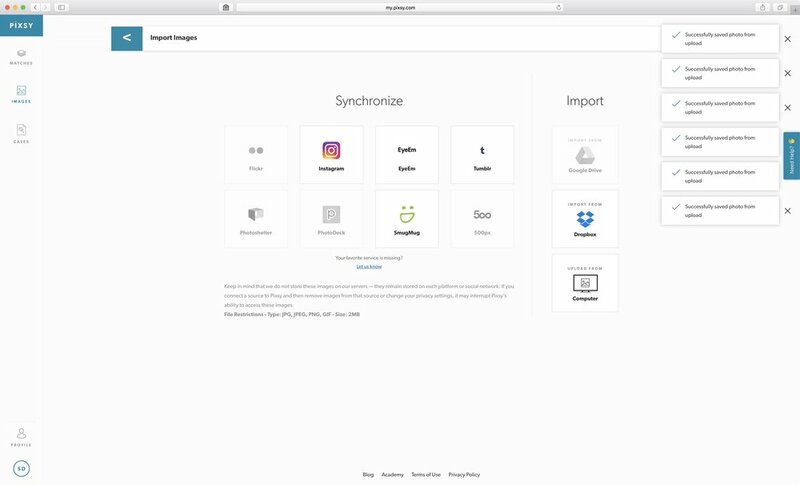 Click Images on the left side and use then Import in the upper right. You can tell Pixsy to monitor your social media accounts, or directly upload images into Pixsy. Personally, I directly upload my photos. That fits best with my workflow. It also avoids situations when I delete a social media post, or otherwise rearrange my social feeds. Having the photos within the Pixsy ecosystem provides me with the cleanest experience. Once you have told Pixsy about your images, it scours the web searching for matches. Using the Settings under your Profile in the lower left corner, you can configure Pixsy to email you a match report daily, weekly, or monthly. I prefer a weekly report, and generally pop into Pixsy once a week to review new matches. The landing page has a bunch of tiles. Clicking on a tile filters your matches according to the tile. You can sift the matches in all sorts of ways. I'll admit it's interesting to peruse the by-country matches to see what images of mine are more "popular" in various parts of the world. You will be surprised at the number of matches. Image aggregation sites will appear often. You will probably also find your own website. Pixsy has additional smarts to approve or ignore segments of the web to limit the noise. I'll talk more about those a little later in this article. When it comes to looking for serious infringements, I focus on commercial matches. Pixsy helps greatly with the classification. For this post, I'll drill down into the New Since... tile. In a filtered view, a grid of thumbnails is shown. Each thumbnail represents a photo Pixsy has found on the web that resembles one of your photos. 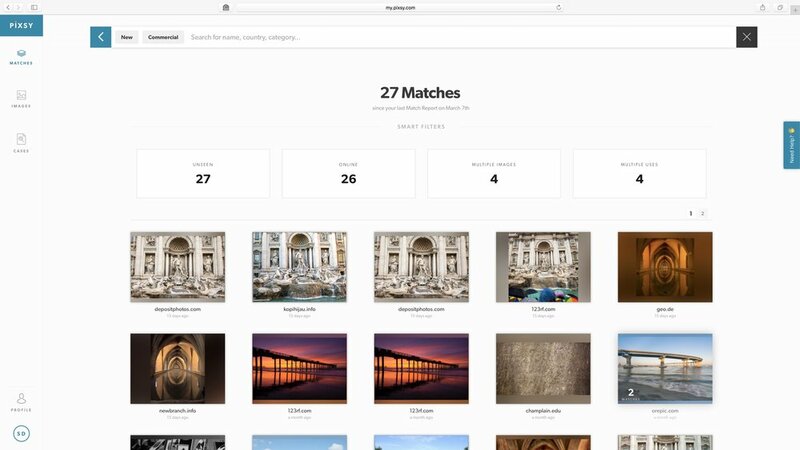 You'll see from this example when you take a photo of an iconic location, such as Zabriskie Point in Death Valley, you can expect a larger number of matches will be found. However, we are not done filtering yet. Notice the Commercial tile across the top of the photo grid. Pixsy has the smarts to distinguish between image use by a business or corporation vs. non-commercial use on blogs or image aggregators. The filtering is never perfect because the internet is always changing. However, it's a great starting point. Drilling down into the Commercial view, a couple of things happen here. First, the match set to review is palatable. This review began with 1975 matches and I'm quickly down to 27 that need my eyes on them. Second, across the top of the interface is the filter bar. It reads New and Commercial. You can further filter by typing the name of your photo or a country to continue reducing the search parameters. There may still be some false positives (those iconic locations again). Again, the thumbnail presented is the photo Pixsy found out on the web that is similar to photos you imported. Knowing your work is important. I see two images on this screen that look suspiciously like photos I know are mine. The second photo of the Trevi Fountain is very similar to one of my images, although I'm not 100% sure it is my photo. The photo of the Coronado Bridge at the lower right is definitely my photo. It's time for a deeper review. There are several options you have with a potential match. Before you take action, you need a closer look. Clicking on a match lets you see your photo and the potential match side by side. Your photo is on the left and the potential match is on the right. The slider beneath the thumbnails lets you zoom in on the left or right hand side image for a closer comparison. You can also click on the page URL to see the website and page where Pixsy found the potential match. The buttons across the top of the page let you open cases, issue takedown requests, or ignore entire domains from future match reports. The buttons in the main body of the match page apply to the currently displayed image. Some care needs to be taken when reviewing matches. If the photo is not yours, or the website is an image aggregator, simply click Not My Image or Ignore, respectively. If the image is a match, you're not quite ready to file a case. If you license your work or use stock agencies to license your work, it is possible the business or corporation using your photo is doing so legally. There is no single click to determine this. You the photographer need to do the legwork and check if the image in question has been licensed or not. If legally licensed, choose Approved Use. When you do find a commercial infringement on your work, use the Submit Case button. Case submission is easy. If you have a copyright registration, include that information in your case. Pixsy has tools to monitor all your cases, and see the details of each case. 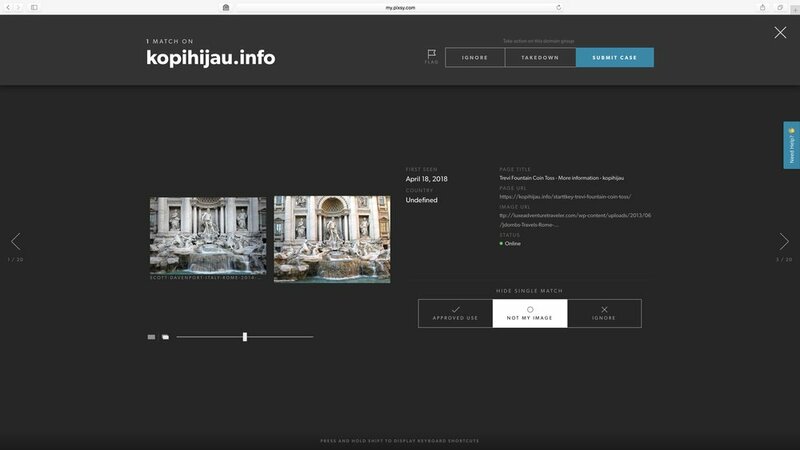 I was not 100% sure the photo of the Trevi Fountain Pixsy found is my photo. In this case, the images are similar but not the same. Selecting Not My Photo makes the most sense. As it turned out, the Coronado Bridge photo mapped back to an image aggregation site, and I used the Ignore button for the image. I hope this introduction into Pixsy and how I use it help you get started protecting your work. There are a few other screens I'd like to show you. Over time, you may find particular websites surfacing again and again in your matches. You can ignore or approve a portion of a domain or an entire domain from the match review screen. I post a lot of videos on YouTube featuring my photography. Often, the auto-generated thumbnails YouTube creates trigger matches in Pixsy. Clicking the Ignore button at the top of the match screen lets you approve or ignore a segment of the web. In this example, I can approve or ignore any future matches found on the 'watch' page of YouTube. At some inevitable point, Pixsy will find your website and report matches against it. This is a perfect time to use this tool and mark your website as Approved Usage across the board. There is no point in reviewing matches from your blog or portfolio. Once you file a case, you can monitor case status. Honestly, I rarely visit these screens. The Pixsy team is excellent at communicating status through email. Nevertheless, you can see all of your cases, filter on their status, and drill down into the details. Payments are electronic and as with every step of the process, notifications of payment schedules are top notch. Notice on the detail screen shown here, the case resolution took more than 1 year to complete. Legal processes can be slow. However, getting rightfully paid for your work is worth it. Pixsy is doing the bulk of the heavy lifting for you... and get more time behind the camera making your next set of great photographs. I had a great chat with Hannah and Kain from Pixsy shortly before this posted. There are loads of new features coming from Pixsy in the next few weeks. Watch this space - I'll be writing more about them when they are live. And go get signed up for Pixsy already!